Myngle Programs. Now offered with FREE Assessment Test and an official Myngle Language Diploma! 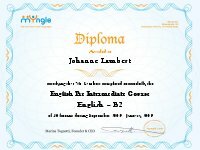 Evaluate your level with our free assessment test , complete your personalized course and receive your official Myngle Language Diploma certifying your level!